Unfortunately, there are no economic minerals in Jersey but deposits of lead and zinc occur at Le Pulec, an inlet just north of L'Êtacq in St. Ouën, and were worked in the late 1800s with no success (Mourant & Warren, 1934. pp. 73 - 88; Ixer, R. A. 1980. pp. 443 - 451; Bishop & Bisson, 1989. pp. 109 - 110). Remnants of the vein(s) can still be found under much seaweed on the western side of the inlet at half tide mark. Zinc blende in ankerite, Le Pulec. On the eastern side of the inlet on the rocky platform, half way to the granite cliffs, there is a narrow gully striking northwest through the granite, which contains an excellent zinc blende vein in a gangue of ankerite (ferroan dolomite) where ferrous iron has substituted for Mg in a solid solution series from dolomite to ankerite (Allaby & Allaby, 1990. pp. 25 - 26). Further south east, in a small roadside granite quarry, there is an excellent exposure of the contact between the Jersey Shale Formation dipping at c. 45 to the NE and granite of the Northwest Igneous Complex. At c.2m up the north wall there is a short, thin, discontinuous vein of silvery molybdenite in the granite which somewhat unusually doesn't extend into the shales. 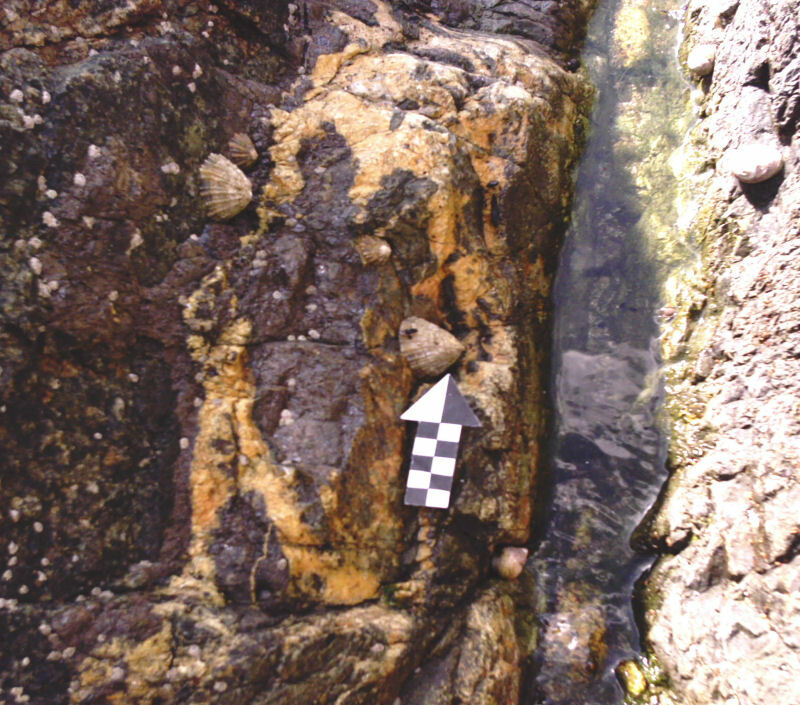 Other discontinuous, narrow veins of red haematite and silvery, crystalline metallic haematite occur in the volcanic rocks between Anne Port Bay and La Crête Point and a barytes vein crops out in a gully at the northern end of Le Petit Portelet, just north of Gorey Castle (Nichols and Hill, 2004, p.18). Other minerals which occur within the formations are described in detail in the Minerals of Jersey (Mourant, 1978, p. 6 et seq.). For more than 4000 years, the main economic use of the rock types has been, and still is, for construction purposes, from Neolithic dolmens to present-day granite-faced houses. There are many disused quarries in Jersey (Cox, 1961, pp. 94 - 97), most of which are easily accessible and it is easy to see the use of the particular stone by examining the nearby walls and buildings. Granite has been used for commercial and industrial buildings throughout the island but generally for buildings in the vicinity of the quarry. The only exception to this is where granites from the various outcrops have been quarried and then transported to various distant building sites if the owner has requested a certain coloured or textured stone, eg. the microgranite (aplite) from Mont Mado. 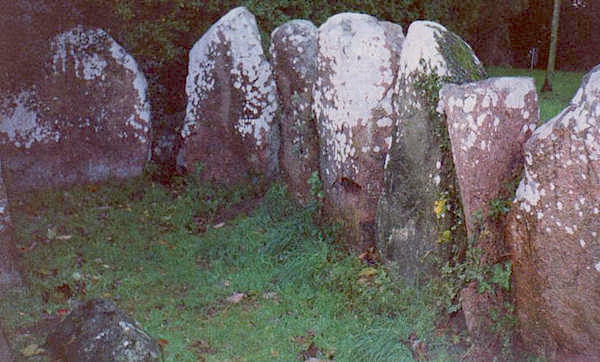 By examining the dolmens, eg. those of Le Mont Ubé, road walls, farms and houses, the churches and castles, the old mills, warehouses, harbour walls, quays and jetties, and investigating the nearby quarries, one can determine which stone is immediately local and which has been brought in. A quick glance at the geology map will then indicate the nearest outcrop and further quarries to visit. Le Mont Ubé dolmen; orthostats of granite and diorite, from outcrops on the nearby south coast? For example, in St. Helier along the north side of the ring road, Le Rouge Bouillon, and alongside Highlands Lane leading down from Highlands College, there are walls of the dark grey, white speckled, porphyritic andesite showing excellent textures, which have been obtained from adjacent quarries and quarries further west which are now parts of residential properties. Around the harbour, the Albert Quay, Victoria Pier and South Pier are made of huge blocks of local pink granite whereas the sea wall to the west is built of La Moye granite from the quarries at La Rosière, east of La Corbière Point. Elizabeth Castle is built of granite and granophyre from the adjacent rocks which also include diorite, and possibly from quarries around Fort Regent which stands on granophyre but which itself has rock imported from Les Minquiers (Mourant, 1956, p. 373). These rocks are part of the Southeast Igneous Complex and are described and illustrated in detail by Bishop, Keen, Salmon and Renouf (2003, pp. 8 - 12). Gorey Castle on Le Mont Orgueil, the Jersey Round Towers and the square Seymour Tower were built of granite from the same complex. Further west, towards in north west part of Grouville Parish, the fine dolmen of La Hougue Bie has massive orthostats and cap stones of granite brought up to the plateau from the coastal outcrops of the south east complex and from elsewhere in the island, while nearer the coast, Le Mont Ubé dolmen orthostats are a mixture of granite and the grey and white and black speckled diorite from the nearby SE coast (see Archaeology). In contrast, the breakwater and slipway at St. Catherine are built from the dark red-brown Rozel Conglomerate capped and edged by an imported grey granite with clear flow - orientated large feldspar laths. The conglomerate has also been used for coins in Augrès Manor (Durrel Wildlife Centre), in Trinity. Rozel Conglomerate, Augrès Manor (zoo). Flow-banded rhyolite column sections, St. Martin's chapel. Houses and walls further south west of the breakwater in St. Martin however, have more stone from the maroon-red, Bouley Rhyolite than the conglomerate (which is a relatively poor building stone), notably seen in St. Martin's Chapel wall where end sections of flow-banded rhyolite columns from the east coast La Crête quarry, have been used. Houses and farms, north and west of Rozel Manor also have masonry of a light yellow, foliated granodiorite (or gneiss) from Les Écréhous. Many tons were brought back to Jersey and carried up the steep lanes from the harbour (Mourant, 1956, p.376) and seems to have been quarried, or in part collected, for specific building purposes. Perhaps it was cheaper than purchasing granite from the island quarries! The La Moye Quarries near and at La Rosière, east of La Corbière Point and at Portelet, St. Brelade have provided granite not only for local parish building but also for construction of the sea walls along St. Aubin's Bay between La Haule and Millbrook. 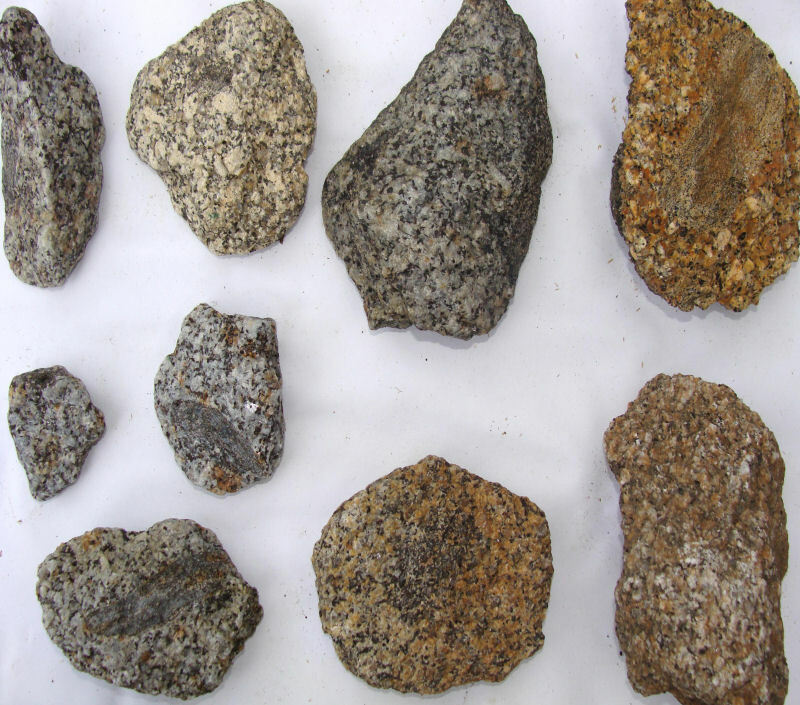 Similarly, the distinctive coarse, grey granites and porphyritic granites from the Northwest Igneous Complex at L'Êtacq, have provided stone for many of the houses, farms and walls in the parish of St. Ouën, and the pink granites with zoned feldspars close to Grosnez Point have provided masonry for Grosnez Castle. The quay for La Grève de Lecq harbour is reported to have been built from the same granite quarried on site. The most distinctive granite is found at the eastern end of this complex. Le Mont Mado granite varies from red to brown and yellow and is generally a finely crystalline microgranite (aplite). The colour variation is determined by the depth of weathering and different levels were quarried to provide variously coloured stone for houses and farms. In general, the twelve Parish Churches are built of stone from their nearest quarries but exotic granite (see below) is present in some of the walls and is well worth a study. A noticeable feature of some buildings, for example St. Ouën's Manor, is the presence of a light to medium grey, finely crystalline, quartz, biotite granite set among the pink masonry. This is locally called Chausey Granite but is a granodiorite, and comes from several small quarries on Isles of Chausey which from their outcrop pattern seem to be part of a granite boss situated southeast of Jersey and just west of Granville in Normandy. This was used because it was a little softer and easier to work. Chausey granodiorites ; NB darker xenoliths, some gneissic; top left used in Jersey. (These rocks, and the archipelago, have been beautifully illustrated in Lithothèque de Normandie, the work of Jacques Aubry and Francoise Gigot with contributions from P. Gigot, O. Dugue, L. Dupret and J. Le Gall of the University de Caen). Along La Route de la Vallée (St. Peter's Valley), many of the walls and houses down to the coast are noticeable because they have been constructed out of the grey siltstone and greywacke from quarries in the Jersey Shale Formation in the valley sides. Many have been rendered as the 'shales', although reasonably hard, can weather and split faster than the igneous rocks. It is interesting to note though, that where the walls are unrendered, the 'shale' has been used with its bedding plane face vertically exposed to the weather within the wall masonry. Other exotic stone which can be found in Jersey is Caen Stone, a distinctive yellow, shelly limestone from near Caen in northern Normandy which has been used, for example, as one or two of the steps in Gorey Castle and as window sills at La Grève de Lecq Barracks. Elsewhere, flagstones of Portland Stone have been used in various yards, rooms and corridors of some of the old town houses. Three quarries, in the NW Complex, still provide masonry for construction and road metal and much stone is recycled. Ronez Quarry on the north coast in St. John provides some granite, granodiorite and diorite, but most of its rock is crushed and used for aggregate, concrete blocks and road metal. Gigoulande Quarry (Granite Products) in St. Peter's Valley offers the same products from pink granite in the southern part of the outcrop, while at La Saline near the eastern margin of the complex in St. John, more ornamental stone of the Mont Mado granite is produced. At La Saline, there are two quarries nearly opposite one another. In the one on the north side of the road, the masons concentrate on working the red and black speckled, aplite-like Mont Mado microgranite as well as providing imported, polished varieties of other rock types for building and ornamental purposes respectively. In the one on the south side, masons rework former granite building stone for recycling. These are presently the sands and gravels of the St. Ouën's Bay area, although in the late 1800s and early 1900s there were china clay quarries where the Handois reservoirs are now, in the north central part of St. Lawrence, and several companies used residual clay for brick making in parts of St. Saviour. 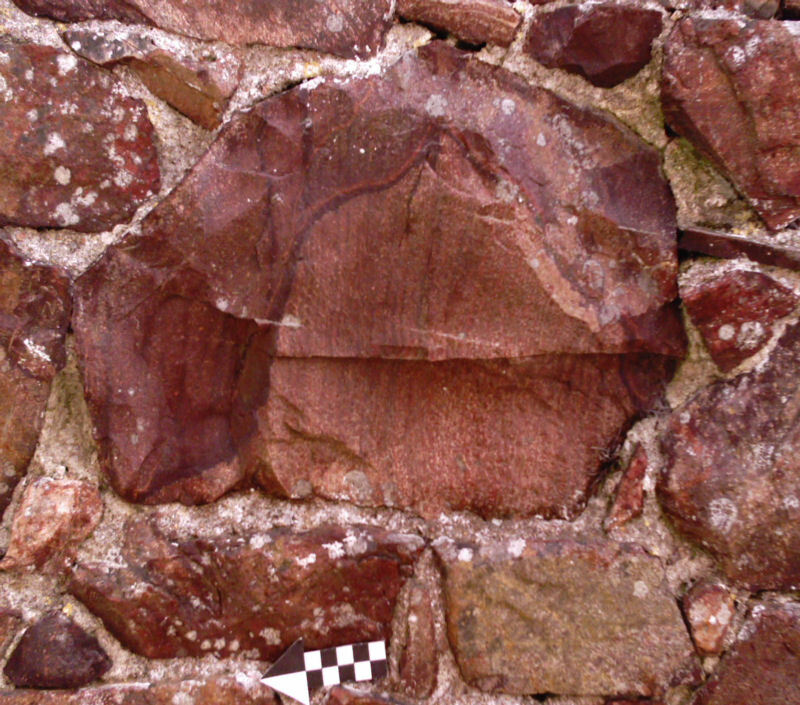 At La Hougue Bie, the Archaeology Section of La Société Jersiaise is presently compiling a brick archive. At present, Simon's Sand and Gravel work the deposits left by the sea and wind during periods of differing sea levels. Wind blown (aeolian) sand also occurs and forms the high dunes adjacent to the site. The various sand and gravel layers are well exposed in the excavated faces and are also interbedded with minor peat horizons which have to be discarded. The gravels and sands are used to make concrete and the cement respectively by various construction companies. Mourant, A. E. 1956. 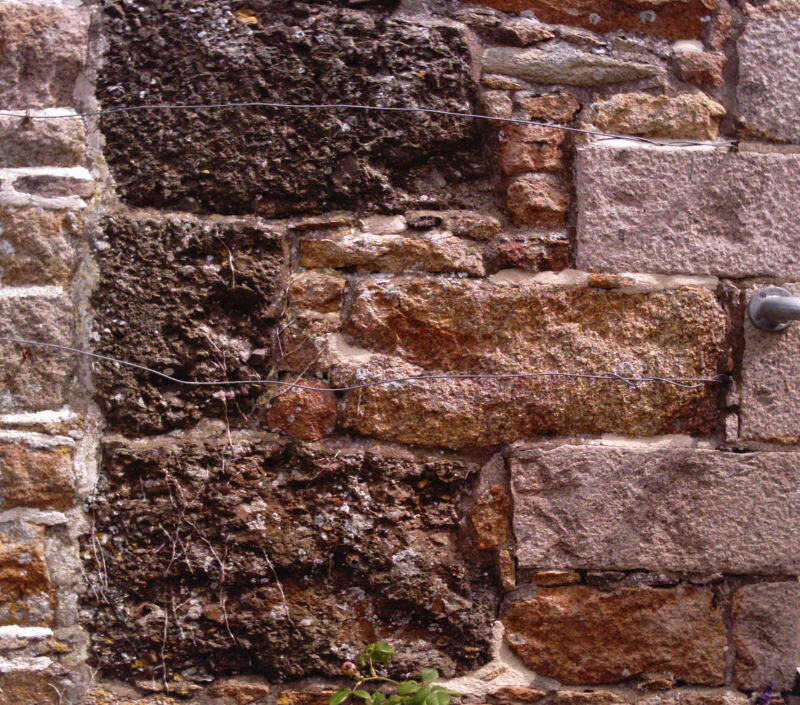 The use of Écréhous stone in Jersey.Bull. Ann. Soc. Jersiaise. Vol. 16. pp. 373 - 376. Nichols, R. A. H. and Hill, A. E. 2004. Jersey Geology Trail. Private publication. Printed by The Charlesworth Group.